Is there a better alternative to QuickPick? Is QuickPick really the best app in System category? Will QuickPick work good on macOS 10.13.4? 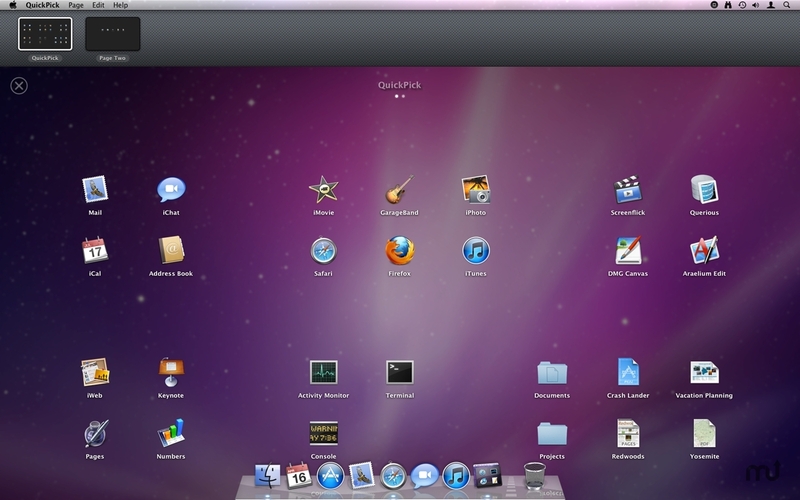 QuickPick is an application and document launcher designed to feel as if it's part of Mac OS X itself. Just drag and drop any number of applications or documents into the QuickPick window, and they'll only ever be a mouse click, flick, or key press away. Watch video tour. QuickPick is a great place to store documents and applications that you use frequently. When it comes to launching, QuickPick replaces the roles of Finder, Spotlight, Stacks, and the Dock with one quick and easy interface, that is fast to use with the keyboard or the mouse. Version 2.1.3: Release notes were unavailable when this listing was updated. QuickPick keeps any number of applications just a mouse flick (or keyboard shortcut) away. When you activate QuickPick, all of the windows on your system will zoom off into the distance, and the documents and apps you want close by will fly right into view. It's like having a fourth dimension just for your files. QuickPick displays files, folders, and application as clickable icons which can be arranged in any way you want by simply dragging them around, similar to the Desktop in Finder. To launch an application or open a document from inside of QuickPick, just click on it. You can also select and launch items with the keyboard. To launch an application or open a document from inside of QuickPick, just click on it. QuickPick will hide itself when an item is launched or switch to another application. To reactivate QuickPick, you can click on it in the Dock, press a keyboard shortcut, or flick the mouse cursor into the corner of your screen. To close QuickPick, you can press the Escape key or just switch to another application. You can also launch an item in QuickPick using the keyboard. When one or more items are selected, simply press the Return key to launch them. Typing to select an item is also easy. Simply start typing and QuickPick will begin looking for the item, immediately showing you what it has found. Once you've narrowed in on the item you want to launch, just press the Return key. You can add files into QuickPick at any time by drag and drop. To remove items select them, and press the Delete key.